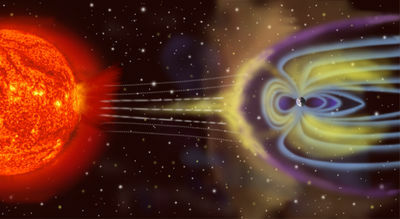 NASA photo: Solar particles interacting with Earth’s magnetosphere. Nine times out of ten when a person found out that I worked with hospice they’d stare at me wide-eyed and say I could never do that. But I was never fooled by this. Of course they could. Anybody can. Bathing, dressing, and toileting are not rocket science. They don’t require rare tools or four hands. I always knew what people really meant was I never WANT to do that…a sentiment which, while perfectly normal and near-universally shared, is irrelevant. Life is full of things we don’t want to do but at some point wind up doing anyway. And sometimes, much to our surprise, when the time comes we wind up doing them gladly. It’s important to remember that, no matter how skillfully we hide, sooner or later we’re probably going to be dragged back out of our hole and plumped down beside the death bed of someone we love anyway. And once we’re there, yes, of course we’ll be as rumpled, wild-haired, and sleep-deprived as everyone else who ever sat by a death bed before us. But here’s the thing. With as hard and devastating as it’s likely to be, we’ll also probably experience that same unexpected, fierce moment when we completely forget about how we never wanted to be there, because all we now feel is a throbbing, shattering gratitude that we are. That we get to hang on for dear life to their hand one last time and whisper how deeply, how much, we will always, always love them. Y’know, there’s nothing wrong with the profound and irreparable wounding that comes to us through our great love for one another. Far from it. This wounding is essential and deeply human. We’re supposed to be dragged under and scarred sometimes. It’s a big part of what helps save us from the aching emptiness of a shallow life. I’m not trying to mislead anyone here—all beauty aside, dying and its accompanying losses tend to be brutal for everyone involved. But I’m telling you, somehow every single person I worked with went right ahead and navigated the journey anyway…and I can’t begin to tell you how much that one, simple fact floored me. At first I couldn’t quite believe it. Then later, as I watched each one of those ordinary, average, regular, everyday people negotiate an event with a destructive power equal to any earthquake or solar flare, I experienced a growing sense of both wonder and indignation. Wonder at how infinitely much stronger we are than I’d previously understood. And indignation that somehow, somewhere along the line, I’d been lead to believe we weren’t. Once again, Dia. Your way of organizing thought and words and observation and emotion astounds me. I hope you won’t mind if I post a link to this entry on my FB page. It needs to be read. Thanks Linda and you are ALWAYS welcome to link anything here to your FB page. I’m thrilled and flattered that you want to.